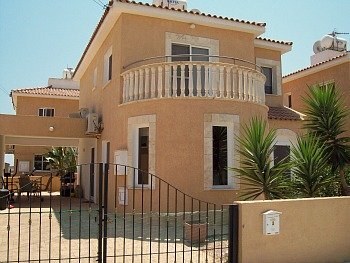 Demand is high for Cyprus villas for rent. Long Term Rentals in Cyprus are in very high demand right now. Many properties for rent are already taken before I can add them to my site. If you are look for Cyprus villas for rent, you really need to be on ball. Due to the economic climate, more and more Cyprus property owners are choosing to rent out their property on a long term rental basis. The monthly rentals are very affordable. At the same time, many more people want to rent property rather than buy at the moment. Mainly due the the global property market being stagnant. A 3 bedroom villa with communal pool pictured above, will cost around 500 euros a month. Utility bills are paid by the tenants and the refuge collection part of the council tax which is around 150 euros a year. Not bad considering the bins are emptied twice a week. Many property owners will also rent their Cyprus villa or apartment fully furnished. If that's not the case they will usual be part furnished. For example, they may leave all the white goods and some smaller electrical appliances. Such as kettle and toaster, pots, pans, crockery. The villa pictured above, is a prime example of a high quality Cyprus property for rent at the moment. It has 3 large bedrooms, 2 shower rooms and 1 large bathroom. Well decorated, fully furnished, satelite television, internet facility available Most windows and outer doors are fitted with flyscreens. There is a communal pool just behind the property with is one of 6 vills around the swimming pool. 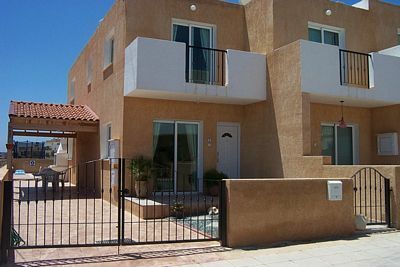 The property just above is a 2 bedroom townhouse with its own swimming pool. Its really well decorated. Has a medium size kitchen with dining are. All mod cons, white goods and fully furnished lounge and bedrooms. The pool maintainance is handled by a well qualified swimming pool expert. The tenant is responsible for the maintenance fees. If the tenant decided to maintain the pool, they will need to sign a contract to take fully responsibility.